This table was made using an additive digital manufacturing technique known as stereolithography. 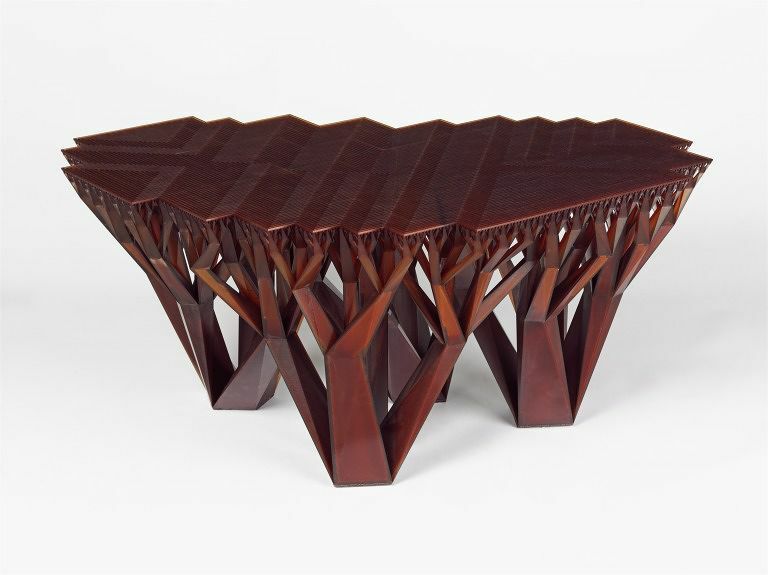 The table's complex, interlocking structure is based on the form of the dragon tree (Dracaena). The design was created first as a computer model - using mathematical formulas to replicate this tree's repeating, 'fractal' branch structure. The table was manufactured over a period of 7 to 10 days. Very thin layers of liquid epoxy resin were spread onto a metal plate, in a sealed tank. UV lasers were then used to 'draw' the table's design onto these layers of resin. The lasers would solidify those areas that they struck, each solid section becoming a small horizontal 'slice' of the table. The lasers bonded each new layer to the last, slowly building the form of the table from bottom to top. The design of this table is based on the form of the dragon tree (Dracaena). To develop the computer models for the table, the designers used mathematical algorithms to create a design which reproduced the fractal growth patterns found in tree's branching structure. A fractal is a geometric shape that can be split into parts, each part being a smaller copy of the whole. 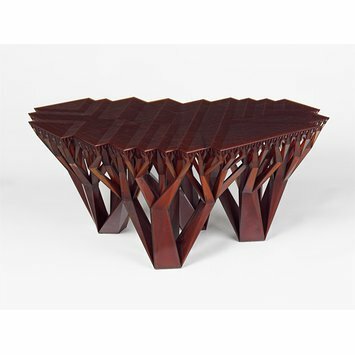 In manufacturing this table, it was the use of an additive digital technique that allowed the designers to reproduce these complex, repeating forms in 3D. The table's complicated interlocking structure could not be easily built using other techniques. The table was manufactured using an additive digital 'printing' process known as stereolithography. Thin layers (of about 0.1 mm) of liquid epoxy resin were spread on to a metal plate, in a sealed tank. After each layer had been spread, UV lasers were used to trace the form of the table in the liquid resin. Each area touched by the laser would harden to create one horizontal layer of the table. Those areas of resin not touched by the laser remained liquid, and fell away once the table was complete. As each layer was spread and lasered, it bonded to those beneath it. Through this process, the form of the table gradually grew. It took 7 to 10 days for the hundreds of horizontal layers to be added. Once complete, the table was cleaned and put into a UV oven for 'post-curing' - to further harden the resin. The clear epoxy resin was then dyed by putting the table into a pigment bath for a day. While 3D printing techniques have been developed since the late 1970s and 1980s, the huge expense and complication of early technologies mean that it is only recently that designers have begun to experiment more widely with them. This table highlights the potential which additive digital manufacturing technqiues offer for complex design. The table's branching structure could only be created due to the additive process through which it was formed. Epoxy resin table, the hollow structure filled with polyurethane. Number 7 of an edition of 25. Here, a type of additive manufacturing called stereolithography was used. Epoxy resin was spread on the base of a sealed tank. When struck by a UV laser, the designated areas hardened to create one horizontal layer of the table. Untouched areas remained liquid. Hundreds of horizontal layers were added over 7–10 days until the completed table was removed from the liquid. Curing and pigmenting followed.